One of the great things about WorkFlowy is that there is no difference between a category, a note, a task, or anything else you create. All of them are just bullet points. This means it’s easy to turn notes into tasks (by assigning people to them) or add notes under tasks (simply by adding more bullet points under them). It also means you never need to waste time thinking, “Is this a task? Is this a note? Is this a category?” – you just start typing. Tagging is a powerful feature that lets you add additional layers of organization to the normal WorkFlowy hierarchy. We use them all the time at WorkFlowy HQ. We recommend using @name tags to assign tasks to people on your team. We add the@mike and @jesse tags to tasks to assign them to ourselves. You can add easily-accessible tags to root level of your list to see all the tasks assigned to a person in one click. We also use #current and #next tags to indicate which tasks we’re working on now and which ones we intend to work on next. 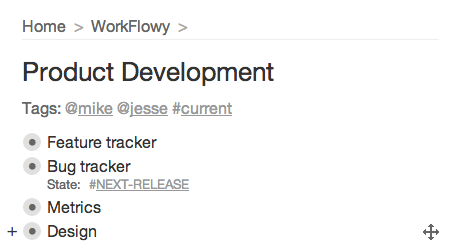 That means I can search for “@jesse #current” to see what Jesse is working on right now. The simple combination of @name tags and #current is quite powerful for project management. 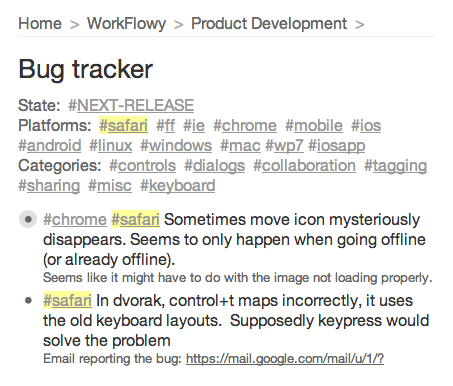 Our bug tracker is a flat list of bugs that are tagged into platform and categories. Platforms include browsers and mobile OSes (#chrome, #firefox, #ios, etc.) and categories include things like #collaboration, #controls, and so on. We list these tags in the note under the “Bug Tracker” item, which shows up above the list of bugs. Click on a tag and you see only the bugs relevant to that tag. We also have a #NEXT-RELEASE tag that we sometimes use to tag bugs that should block our next release. These are just two of our uses of tags. We’ll go into more in the future. Next Post How Big Can a WorkFlowy Account Get? In new features I requested the ability to color entries to see them more readily in a long document and to have hyperlinks between items. I had forgotten about using @ and # tags. Tags can serve as effectively as hyperlinks. Hadn’t used Workflowy for awhile, until we started a remodeling project in our home. Very easy to record each of the contractor’s tasks and costs, and where we had to go to buy materials, and what to buy, and web URLs for materials research. The only problem with this is how to associate a bug with customer(s)/communication channels that expressed concerns regarding the bug. I think its worth following up when a bug fix is pushed to notify affected users so they get a chance to review the issue. Its a great opportunity to interact with the customer in a positive light and can assist with retention. Hi, is it possible to share a tag? For example, would like to share @My_Employee tag with him (so he would see only his list). We don’t have any special collaboration features related to tagging. It’s something our team hopes to develop in the future. Is it possible to somehow list/see ALL of the tags in one’s workflowy? For example i might have made tags that i have forgotten about, but might be useful to remind myself of… is there a way of simply listing all of the # and @ words/phrases? Even if i search for just # or @ , the search window lists only 8 tags, is there some way of listing all of the tags within a given list? If you make sure that you are at ‘Home’ – the very top of your space, then searching on those tagging prefixes (# and @), that should work. If you are in any sub branch, then it will only show those tags that are at that level or lower. However, if you use Chrome as a browser, you may want to look into the “Workfindy” extension which does a global search. Thanks. Yes i can do that but given that i have an # or an @ in almost every line of every list, this search returns my entire workflowy 😦 what would be great if there was a way to just see the list of tagged words themselves… I would periodically look, update and paste that list somewhere to remind me of the kinds of tags i have assigned. I don’t really see the difference between @ and # tags. And why stop there? Why not $ tags or & tags? Actually, I have an intuition about why there are two types of tags – not one, and not three or more. But I’m curious to hear your thoughts and reasoning. We want to create different functionality for different tag types, @ would be for people # for general categories. Yeah $ could be for money, etc. ! will probably be for dates, I’ve been thinking of % for different formatting options, like %sort:a-z, etc. That said, they don’t function differently even though they appear different. That is to say, there is no enforcing mechanism. I could use # for farm animals and @ for suppliers. Non enforcing mechanism is preferred. Funny because I was just searching for a third unique tag type–hope more are in the pipeline. Thanks again for an awesome product!